Supposedly, if you give a baby hundreds of toys to choose from, he’ll get totally overwhelmed and not play with a single one. We, like spoiled rotten babies, have had a similar reaction to reviewing Chicago’s Italian restaurants. Chicago is home to some of the best Italian cuisine in the country, but where do we begin when there are literally thousands of Italian restaurants, one on almost every corner? And how can we compare a place like Spiaggia to a neighborhood osteria? And what about pizza? Pizza! And how many Italian restaurant reviews will you, our friends, read before you fall asleep or abandon us forever? Life is so complicated; we’ll just do our best and hope you like us anyway. Andiamo. Enoteca Roma (Wicker Park) – We love this small, somewhat low-key (for Wicker Park) eatery for its incredibly flavorful bruschettas, cheeses and pastas. We love the family-style approach and the way they pour their polenta onto marble slabs. We love their patio too. Really though, there’s no trick to why they’re first on our list; the food is superior and that’s what matters. Rose Angelis (Lincoln Park) - We doubt you’ll find this one on many other Best Italian lists, but you should. It’s hard to beat Rose Angelis’ huge portions of hearty, homemade pasta. Formerly the first floor of a home, the cozy layout and setting will charm your pants off (they’ll already be unbuttoned to make room for your pasta baby). As impossible as it may seem, try to leave room for one of their spectacular desserts. Piccolo Sogno (River West) – A “little dream” come true. This upscale Northern Italian restaurant’s menu is as fabulous as its decor. An impressive place to take out-of-towners, but make your reservation well in advance. Their mozzarella cheese melts on the tongue and their wine list is impeccable. 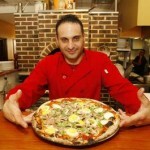 They use authentic ingredients combined in wonderful ways, presented artfully. If you go to their website, be prepared to rock out to some dramatic Italian crooning that starts off like a smooth jazz rendition of the theme song from St. Elmo’s Fire. Anteprima (Andersonville) - This one almost didn’t make the cut because one of us finds it underwhelming, but here it is, numero quattro, and nobody has to sleep on the couch. Everyone’s a winner! 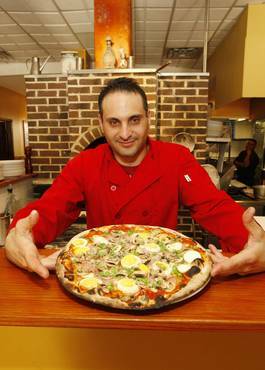 Anteprima serves rustic Italian dishes with local, seasonally-inspired ingredients. 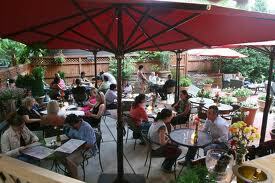 The atmosphere is warm and cheerful and totally unpretentious. They also make their own limoncello. Yum. Cibo Matto (Loop) and Pelago (Gold Coast) – Between these two, it’s toss up. Both are trendy and oozing with swank. Cibo Matto is located in the ultra-hip Wit hotel; Pelago in the boutique Raffaello Hotel. Cibo Matto is over-the-top stylish while Pelago is more reserved and sophisticated. Both serve Italian gourmet with a modern twist. We suggest the Pollo a Griglia at Cibo Matto and the fettuccine with truffles at Pelago. Our Favorite Italian Sandwiches – Narrowly beating out the neighborhood fave, Piatto Pronto (Edgewater) is L’Apetito Imported Italian Foods (Near North Side). Check out this Italian deli and delicacy store and get an amazing sandwich to go. Avoid the tourist trap in the Hancock and stop by the deli in the cathedral district. We suggest Il Parma. 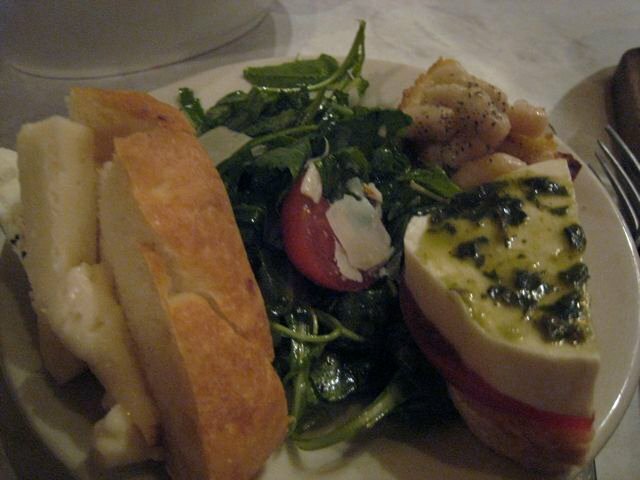 It’s topped with the best fresh mozzarella to squeeze it’s way between two slices of bread. We’re still in search of our favorite gelato. Got tips? If we missed one of your faves, use the comment section to let us know. We’d love to try it … or tell you why we omitted it (probably because of the weird smell and the cockroaches). In the meantime, we’ll just be sitting here, staring at our toys and throwing temper tantrums. It must be the place to have birthday dinners in Chicago. I’ve been to maybe 5 birthday dinners since I moved here, and Enoteca Roma was the site of two of them–the first one I’ve ever been to here, and my most recent, which was a few weeks ago. The first time, I had no idea what to expect. This was back when the lady and I were still long-distance relationshipping, and I flew in from New York on a Friday when she had plans. There was nothing definite scheduled between us*, so I took a cab to meet her at her friend’s birthday party. At Enoteca Roma. I thought I’d be eating a cardboard burger at the airport, and I ended up with one of the best Italian meals I’ve ever had. So when I found out we were going back, I couldn’t have been more excited. *If you’ve ever made regular trips between Chicago and New York, you know why we didn’t clear our schedules. Seriously, like 75% of the time the flight is delayed. The deal with Enoteca Roma, and the reason I think it’s such a hit with the birthday crowds, is the Mangia Mangia meal. It’s a never ending parade of deliciousness. They cater the portions to the size of your party, though with the amount of food they bring out, I think they may have trouble counting. They could have fed a party twice our size. I’ve also heard good things about the supposedly awesome back patio, though I’ve never eaten outside, and the connected bakery, Letizia’s, though I’ve never had room for dessert. So, the food. You start with cheese, meat and bread. And let me tell you, they had me with the smoked and cured meats. I could have put this course on an endless loop and died a smoked, cured and happy man. Then comes the bruschetta and salad, which would be a highlight in most cases, but here, they’re surrounded by such greatness, you forget about them. I hope these dishes don’t mind, because we were good friends at the time, but by the time the end of the meal came, we’d grown apart. Mussels. Delicious, with plenty of bread to soak up the stew. Polenta topped with a meat sauce. Kapow. But don’t fill up, we’re only halfway through. Italian sausage. Tasty and moist, though a little outdone by the other courses. And assorted pastas. Noodles, raviolis, white sauces, red sauces. It’s just one after the other, delicious dish after delicious dish. I think that one more reason that this is such a popular birthday spot is that most people can only manage to enjoy this much good food once a year. 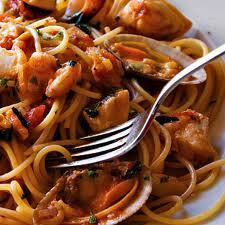 This is some wonderful Italian food. I can’t wait for my next friend’s birthday party. The Mangia Mangia meal is exactly what you should not be eating just weeks before you have to squeeze into a wedding dress. I don’t care. It was worth every creamy, cheesy, carb-laden calorie. Unlike my guy, I am not a fickle friend to the bruschetta. This wasn’t bunch of diced tomato crap scooped onto bread. Oh, no. There were ten different kinds! To name a few: black olive pate and capers, cannellini beans and red onions, strawberries with mascarpone and balsamic reduction, pear with honey and parmesan, brie and apple. I couldn’t get enough of the stuff. I will never forget you, sweet bruschetta. Then came the tableside polenta. Total one upper. Like a messenger from the heavens, our waiter poured the warm cornmeal onto a slab of cool marble. With loving precision, he topped it with spoonful after spoonful of sauce. Since there were several vegetarians at the table, he covered ours in quattro formaggi, a creamy four-cheese medley that’s making my mouth water as I type. And the pasta. Oh, the pasta. The orecchiette overflowed with garlicky, peppery flavor. Nothing, however, could have prepared me for the ecstasy that was the homemade pear ravioli, served in a walnut cream sauce.